We have chosen the Victoria Falls/ Mosi-Oa-Tunya UNESCO World Heritage Site, covering Zambia and Zimbabwe (and also including the area of the Zambezi National Park), as the focal point for the first phase of our project development. This area, together with the second phase development areas of Hwange National Park, Mana Pools National Park (Zimbabwe), Lower Zambezi National Park (Zambia), Chobe National Park (Botswana) and surrounding areas, will form the core area for the initial development of our digital media and ecotourism services. The Zambezi river and its basin, together with the Okavango river and delta system, are significant geographical features of sub-Sahara Africa, with one of the seven Natural Wonders of the World, the Victoria Falls, at its centre. 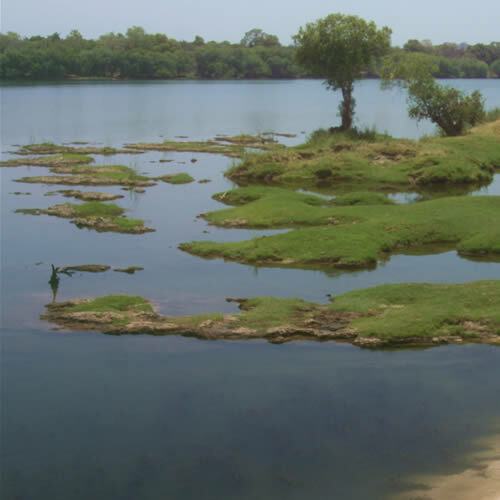 The river basin catchment area of the Zambezi covers nine countries - Zambia, Congo, Angola, Namibia, Botswana, Zimbabwe, Malwai, Tanzania and Mozambique. The Victoria Falls/ Mosi-Oa-Tunya UNESCO World Heritage Site and associated regional protected areas represent the heart of the proposed Okavango-Zambezi Trans-Frontier Conservation Area (KAZA TFCA), covering primarily Botswana, Zambia and Zimbabwe (but also Angola and Namibia), and provide a unique opportunity to develop world-class eco-tourism projects with truly international potential. These countries will form our initial Focal Development Area for developing resources and capacity, and we aim to expand in two phases to include Namibia and Angola (as part of the TFCA), and Malawi and Mozambique (as part of the Zambezi river basin) within our area of operations. This extended area forms one of the most substantial wilderness areas left in Africa, representing varied and ecologically unique habitats, whilst also being home to the largest concentration of wild elephant populations in Africa and home to internationally significant populations of lion, wild dog and other vulnerable and endangered species. Located on either side of the Zambezi River, in north-western Zimbabwe and southern Zambia respectively, the Victoria Falls National Park (1,900ha) and Mosi-Oa-Tunya National Park (6,880ha) were inscribed by UNESCO on the World Heritage List in 1989. 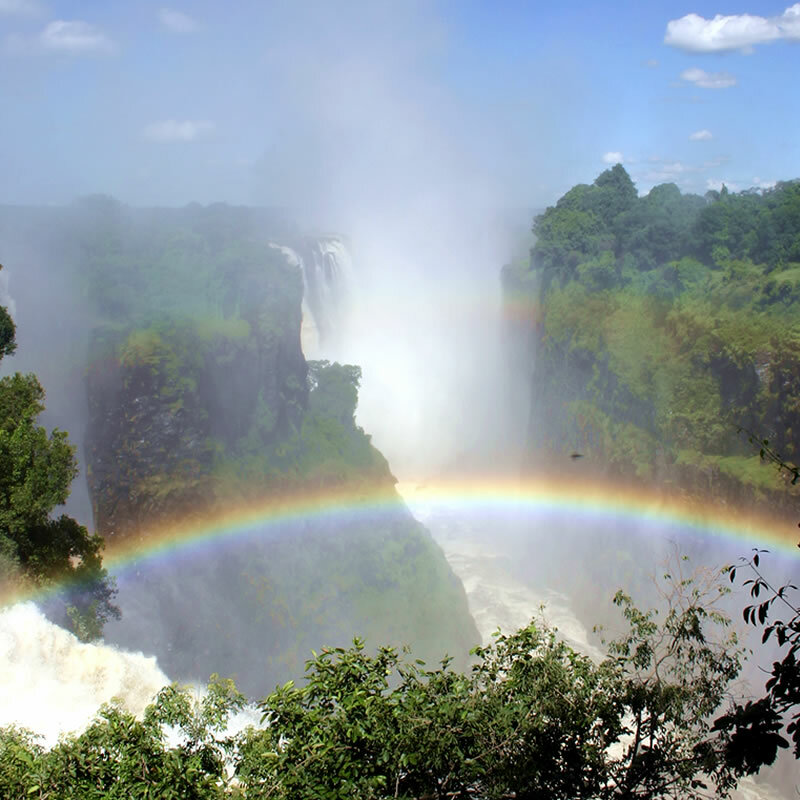 The Mosi-Oa-Tunya or Victoria Falls is one of the worlds most spectacular waterfalls. The Falls and associated gorges and rapids downstream are an outstanding example of a river capture and the upstream erosive forces of the water as it erodes into the solid basalt bedrock, forming one of the seven so called ‘Natural Wonders of the World’. The Victoria Falls, which are 1708m wide, are the single most significant feature of both parks, and when the Zambezi is in full flood (usually February or March) the Falls form the largest curtain of falling water in the world – giving rise to the local name 'Mosi-Oa-Tunya' - the Smoke that Thunders). During these periods, over 500 million litres or water per minute go over the falls, dropping up to 99m into the chasm below. At low water in November flow can be reduced to around 10 million litres/minute, and the river is divided into a series of braided channels that descend in many separate Falls. The riverine 'rain forest' within the waterfall splash zone is a fragile ecosystem, containing many unique plant species, and a wide variety of waterbirds frequent the contrasting river environs above and below the Falls. After the Falls, the Zambezi river hurtles through the Batoka gorge system downstream for 120km carving through basalt rock. Immediately below the falls the river enters a narrow series of zig-zagging gorges which represent successive locations occupied by earlier fall-lines before the power of the Falls eroded upstream. Since the uplifting of the Makgadikgadi Pan area some two million years ago, the Zambezi River has been eroding through the basalt, exploiting weak fissures, and forming a series of retreating gorges. Seven previous waterfalls occupied the seven gorges below the present Falls, and the Devil's Cataract in Zimbabwe is the starting point for cutting back to a new waterfall that will eventually leave the present lip high above the river in the gorge below. The Falls and Batoka gorges are recognised as an Internationally Important Bird Area (IBA), holding globally significant populations of several breeding bird species, and specifically notable as the home for many species of raptor. • Too many people, too much impact —unruly and insensitive behaviour such as harassing wildlife with too many tour vehicles or noisy visitor behaviour on river cruises and human-generated pollution and litter. • Noise pollution — human-generated sounds that are unnatural for the setting such as loud radios and music in campsites or mechanical noise such as fuel-powered electrical generators at lodges and camps, and motorized vehicles such as motorboats, motorbikes, trucks, light aircraft and helicopters. • Over development — tourists want to get away from the hustle and bustle of urban civilization and development, and they report some development detracts from the wilderness experience: too much infrastructure, too many roads, too many lights, and too many regulations. • Commercial tourism — low-key/low-impact infrastructure and activities designed to be nature-sensitive are acceptable in wilderness areas; however, some commercial tourism detracts from wilderness quality such as luxury high-rise hotels, insensitive architecture, advertising billboards, commercial sales outlets, 'tame' wildlife, and exploitation and harassment by vendors and dealers. • Ecological Impacts — damage or alterations to ecosystems such as tree cutting, wildlife poaching, and the presence of non-native species. 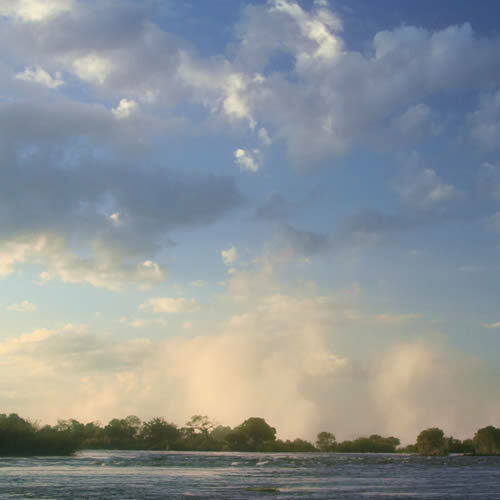 We believe that by encouraging eco-tourism concepts of environmental awareness and responsibility within the tourism industry and wider local business community we can create the foundations on which to strengthen the conservation and protection of the Victoria Falls area, at the same time as developing tourism infrastructure and delivering associated economic benefits. By working together with tourism providers we believe we can encourage an industry-lead commitment to eco-tourism best practice, whilst also developing market demand for eco-tourism products and services. EcoAudited tourism providers will have the opportunity to invest their eco-footprint compensation payments in selected local projects through their eco-balance contributions. Selected tourism operators meeting our eco-tourism standards will be invited to join an exclusive web-based eco-tourism portfolio promoting their specialist services and standards. A unique aspect of our EcoTours will be that tourists will be able to offset the environmental impacts of their holidays (including, most critically, the carbon footprint of their flights) by supporting the same local projects and initiatives as their tourism operators, therefore increasing the local impacts and benefits of tourism.